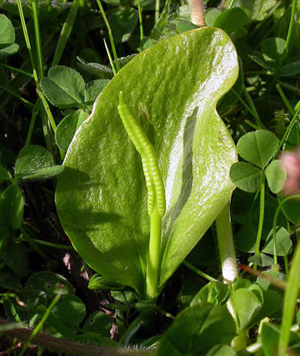 Adder’s tongue is a perennial plant to 1 foot high; its bulbous root is light brown on the outside and white inside. 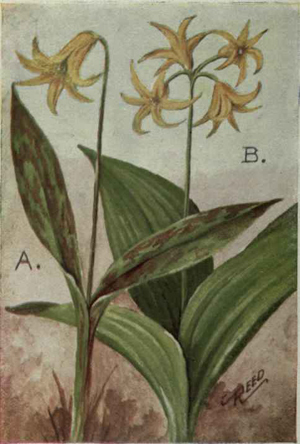 It grows two leathery, basal, lanceolate, pale green, mottled leaves with purplish or brownish spots; and one drooping, miniature, lily-like, yellow flower, petals strongly curved back, nodding from the top of a central stem, appears in April or May. The narrow spike somewhat resembling a snake’s tongue gave the plant the common name of adder’s tongue. The petals partially close at night and on cloudy days; the plant diminishes with the heat of summer. The fruit is a capsule. 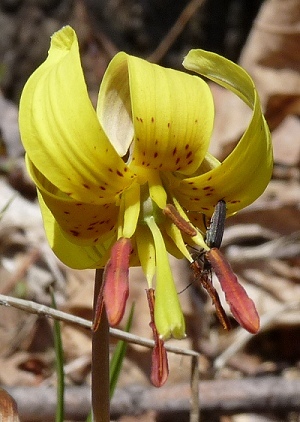 Other varieties: E. californicum; E. giganteum or watsonii; E. hendersonii; E. dens-canis (dog tooth violet), White trout-lily (E. albidum) flowers are white, leaves seldom mottled; found in Ontario to Georgia; Kentucky, Arkansas, Oklahoma to Minnesota; E. grandiflorum is a plant that grows in western North America, been shown to be slightly antimutagenic. Grows in thin moist woods or open areas, moist meadows, with rich soil all over the United States. Nova Scotia to Georgia; Arkansas, Oklahoma to Minnesota. Used for scrofula and other skin problems. Make a poultice for external application and take the infusion at the same time. Mix the expressed juice with cider for internal use if preferred, it probably tastes better. Poultice used for old or scrofulus ulcers, wounds, and tumors, draw out splinters, reduce swelling. Fresh root simmered in milk helps dropsy, hiccoughs, vomiting and bleeding from the lower bowels. Water extracts are active against gram-positive and gram-negative bacteria. Native Americans used the root tea for fevers. Iriquois women ate raw leaves to prevent conception. The plant must be used fresh. Poultice: use crushed leaves, or simmer the root in milk to get the proper consistency. Apply 3-4 times a day. Take with the tea internally.